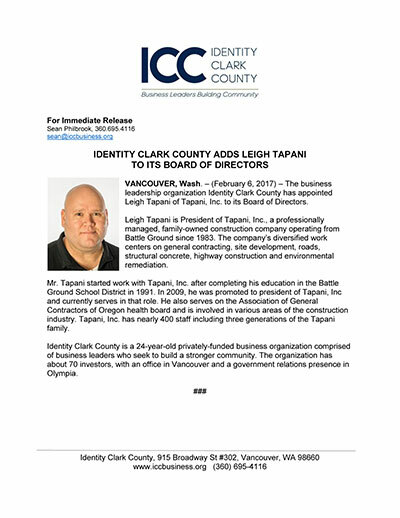 The business leadership organization Identity Clark County has appointed Leigh Tapani of Tapani, Inc. to its Board of Directors. Leigh Tapani is President of Tapani, Inc., a professionally managed, family-owned construction company operating from Battle Ground since 1983. The company’s diversified work centers on general contracting, site development, roads, structural concrete, highway construction and environmental remediation. Mr. Tapani started work with Tapani, Inc. after completing his education in the Battle Ground School District in 1991. In 2009, he was promoted to president of Tapani, Inc and currently serves in that role. He also serves on the Association of General Contractors of Oregon health board and is involved in various areas of the construction industry. Tapani, Inc. has nearly 400 staff including three generations of the Tapani family.